There is nothing better than curling up next to the one you love…that is, unless you and your sleep partner disagree on the bedroom temperature, as so many couples do. If that’s the case, the Sleep Number® Create Your Perfect Comforter is a great solution because each side of the comforter can be customized to the warmth preference of both you and your sleep partner. While the ideal bedroom temperature is in the mid-sixties, individual preferences can lead to conflict and disturbed sleep. 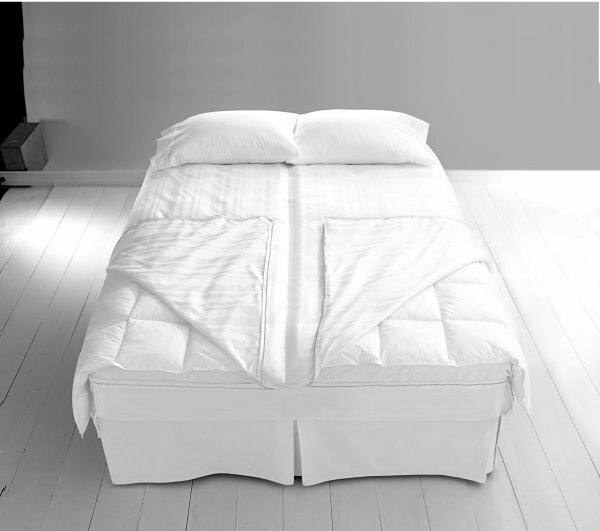 For ideal comfort, purchase bedding that accommodates you both – such as a dual-weight comforter that allows for personalization on each side to warmth preferences. One side can be heavier to keep you warm and the other side lightweight to keep your partner cool. 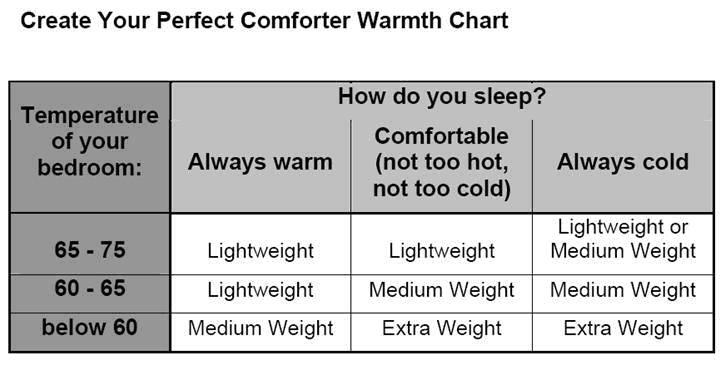 In addition, if you have a difficult time deciding what warmth layers to choose, take a look at the temperature of your bedroom and your sleeping-temperature preference. As you can see from the chart below, we recommend “extra weight” in extreme circumstances. A soft Damask-stripe cover, in 300-thread-count cotton, offers breathable protection for your inner fill inserts. L-shaped zippers on both sides allow you to easily place inserts and ties keep them secure. Choose Your Fill. Personalize your comfort with an insert on each side. Choose from the finest down for high-loft softness, or a premium down alternative, which mimics the comfort of down in a hypoallergenic 100% polyester fill. Customize Your Warmth. Once you’ve chosen your favorite fill, select your ideal warmth level: choose lightweight if you are always warm, to extra weight if you are often cold. Win a Sleep Number® Create Your Perfect Comforter. Last date for entries is December 31, 2010.